Jennifer Choo found a new avenue for dancing when she was introduced to line dancing in 2004. Her initial curiosity soon blossomed into an all-consuming addiction when she discovered that line dancing fulfilled her childhood passion for dancing, provided her a means to keep fit as well as an opportunity to socialize with like-minded enthusiasts. With it also come opportunities to travel to different places locally and internationally to dance and teach. Jennifer started choreographing since 2006. To date, Jennifer has choreographed over 20 dances which were danced worldwide; the better known ones include Hare Ram, Cha Cha Conchita, Love, Love Me Do, At This Moment, Cuban Yeah, Let Me Dance, Zoobi Doobi and Hey Ladies. In 2007, Jennifer took her new passion in life one step further when she started classes of her own. In 2009, Jennifer’s contribution to the line dance community was recognised worldwide when she was featured in theFebruary edition of the Line Dancer Magazine. Since 2010, Jennifer started teaching her choreographies in International dance events alongside other line dance personalities, in “WOW Shanghai 2010” and “Celebrate Dance! Toronto 2011”. Jennifer is also a favourite guest artiste at various events where she was invited to showcase her talent as a performer. Jennifer obtained her UCWDC Judge Entrance Certification in 2011. 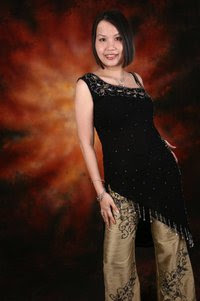 She presently resides in Kuala Lumpur, Malaysia, where she works as a Senior Academic Manager in an e-learning company. She earned her Masters in Educational Technology in 2004. Start dance facing 1:30 after 4x8's. Options: Do the bachata hip bumps when hitches and points are indicated in the descriptions. Note: This dance is specially choreographed for the Kiwanis charity event “Dance For the Children’s Smile” to raise funds and create awareness for Maternal-Neonatal Tetanus worldwide. The song “Terlalu Istimewa” was chosen as it reflects on the emotions of losing a child. ** Do Tag here on Wall 6. Then restart the dance facing 6:00. *Restart – Dance first 6 counts on Wall 4 (facing 6:00) and Restart again facing 6:00. Start dance after 4 counts of silence. Restart: On Wall 4 (facing 6:00), dance only 7 counts of Set 1. On count 8, step RF fw. Then, execute a ½L pivot turn on count 1 shifting weight onto LF and sweep RF from front to back to start Wall 5 (facing 6:00). Alternative Music: There are many different versions to this piece of beautiful music in different languages such as Japanese original ((Song of Sunset) by Masahiko Kondo), Mandarin version (by Lee Yik Kwan), English version (There is Only You in My Heart – Lynda Trang Dai) and many other Cantonese covers by Hong Kong singers such as Anita Mui, Alan Tam and Leslie Cheung. Use a version that you like best. Easier option: Instead of the full turn in counts 8&, you can do run-run as options. Restart after count 16& on walls 2 (6:00) & 6 (12:00). Options: Before the restarts, there are 2 heavy beats, try to hit them with the steps from counts 7& in Set 2 (Side rock). The timing would be 7a to hit these beats and hold on count &. Continue with the ½R hinge turn to start again. Then Restart the dance for Wall 6 facing 3:00. On the Wall 11 (start 12:00), dance up to Set 4 Count 4& facing 9:00. On count 5, do a ¼R to face 12:00. Then do 3 knee pops to the 3 final beats. Then restart the dance again facing 9:00. Note: Special thanks to Evonne Ng for suggesting this beautiful song for choreography. You will be facing 6:00 to Restart the dance. Start Again and enjoy flipping your hair! Restart 1* On walls 2 and 7 (First 2 times facing 3:00), dance until count 12 and substitute counts 13-16 with the syncopated OUTS and INS. &7&8 (facing 4:30) Step RF to R, Step LF to L, (Square back to 3:00) Step RF in, Step LF in. Then restart the dance (3:00). Tag Syncopated Step Touches in a box. START AGAIN! No TAGS, No RESTARTS! Repeat again… No Tags, No Restarts! Relax and Have FUN! Intro: Song will start with a scream and “I Feel Good!” Start on the vocal “Good”. Start again and Have FUN! Then do Set 5 & 6. Do this 16-count tag twice. You’ll finish the tag facing the front wall. For walls 7 and 8, replace count 8-1 of Set 4 (½R Pivot sit) with L chasse for count 8&1. Restart the dance after wall 7. Dance ends after Wall 8. Phrase: 48, 48, 48, 48, 48, 48, Tag (&16 + &16), 32**, 32**. 1. Start when Whitney sings "Sweet" in "BitterSWEET Memories..."
2. Restart only on Wall 2 after 24 counts (same spot) facing back wall). 4. The main dance (32 counts) remain the same! * Restarts on wall 2 (6) and 4 (12), after count 24 of this block (3) on count 1.